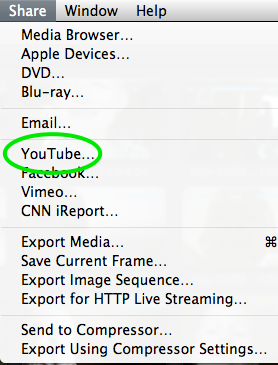 The easiest way to get video from Final Cut Pro X to YouTube is to use the built in features of Final Cut. When your editing is complete select the Share menu and the YouTube… menu item. 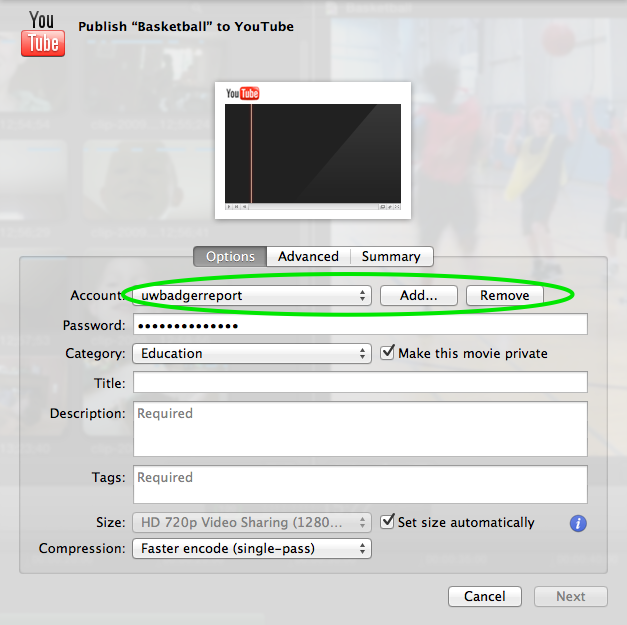 From the YouTube share window your YouTube account needs to be added. Click the Add… button. 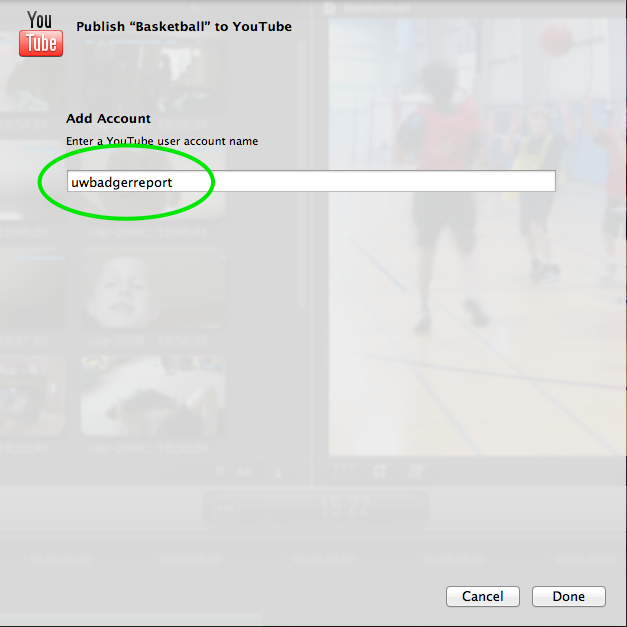 Enter your YouTube account name and select Done. The more descriptive content you place in these fields the better your chances of your video being viewed. If you want to have a chance to preview your video on YouTube before the world can see it make sure the Make this movie private check box is checked. Under Size the Set size automatically check box should be checked unless you are certain you want to override whatever Final Cut chooses. Compression can also be left at the default setting. When done click the Next button. 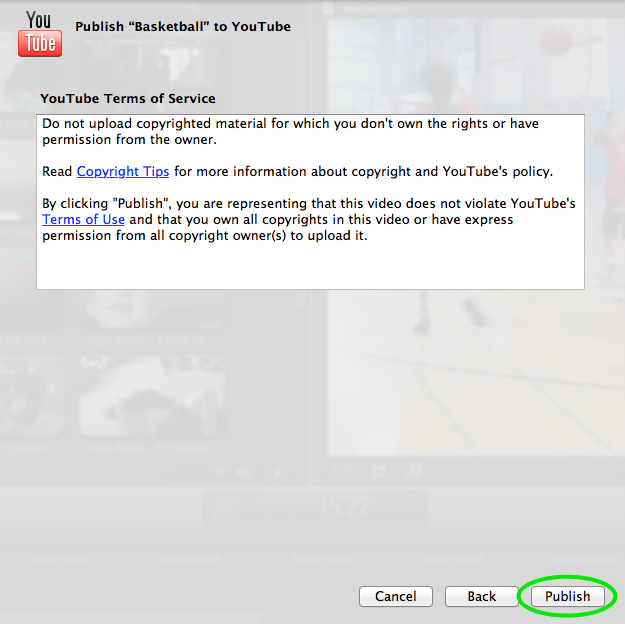 You will be presented with YouTube’s terms of service and from here click Publish. Your video will be encoded and then uploaded by Final Cut. Depending on the length of the video and its resolution this could take a while. When your video is uploaded you can view it on YouTube. Log in to your account at YouTube. In the upper right corner of your browser window click on your user name and select video manager. 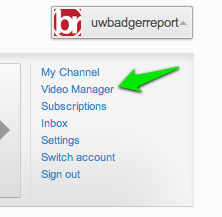 From here you can make changes to all the videos you have uploaded, including making them public.